~ reDefining the soul, in a single resolution. Seize the Moment: Another Quirky goal in progress! I once saw a show where this con artist/pick-pocketer slipped origami into the pockets of people she stole from. This inspired me! 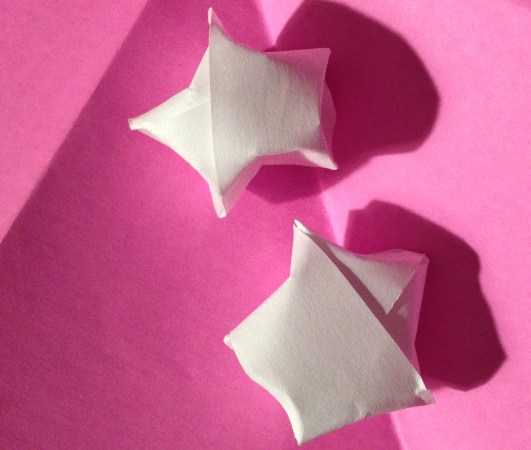 Not to pick-pocket people, but to make origami. So I put it on my list of quirky goals! Now the goal is to learn at least 5 shapes, at least being key. But one thing at a time. Tonight I simply wanted to share one that I made! I’m well on my way to completing this goal. Maybe by the time I’ve got multiple shapes down, I’ll be ready and willing to share the secret reason behind why I want to learn. Stay tuned! Create a Healthy Happy You: Weight off my shoulders…or knees. Create a Healthy, Happy You: Go to bed!